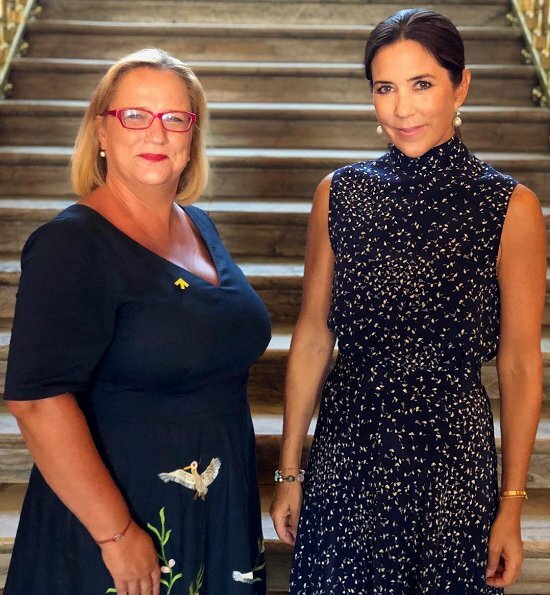 Today, on August 9, Crown Princess Mary of Denmark met with Katja Iversen who is the CEO of "Women Deliver" at the Amalienborg Palace in Copenhagen. The Crown Princess received information about activities of the organization and the preparations for the Women Deliver Conference in Canada in June 2019. Iversen was recently named in the top 10 of Apolitical’s Top 100 Most Influential People in Gender Policy. Prachtig kleedje, de prinses is een plaatje. I love Mary's dress! It looks like a night of summer stars. Very elegant and meeting-appropriate at the same time. 'Birds under the night sky' The 2 ladies dresses compliment each other. Love Mary’s dress! She looks stunning! She’s such a natural and will make a great Queen one day. Is not too dark for summer? Does her hair not look too severe for the outfit? Is sleeveless too casual for a crown princess? Where are the vicious judgemental biddies’ comments or are those solely reserved for the Duchess of Sussex? I don´t find the dress too dark nor her hair too severe. Sleeveless is fine, too. But I will say that I find the arm holes of her dress a bit too large. We cannot see the whole dress, so I will withhold my final judgement, but from what I can see, I find the look very promising. Same goes for the other lady´s dress - great example of how to dress a fuller figure. There are plenty of people speaking positively about Meghan´s style, so please don´t try to make commentators sound like Meghan-haters. I for one sure am not. Agree with you here!I really laught when I saw these pictures.The dress is like a star war inspiration and no way it is looking god on Mary. The hair is to servere and.....no no... awful ugly day fir Mary. 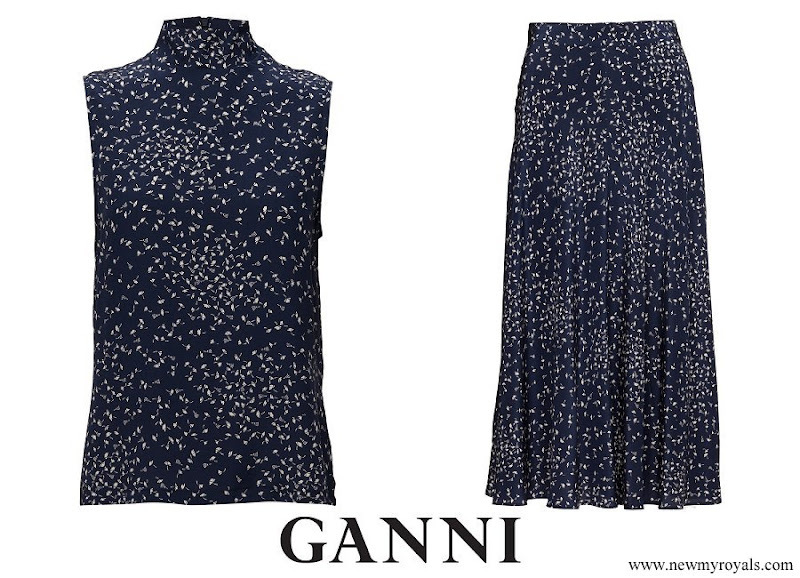 No, the dress is not too dark for summer, as there is no rule in fashion that establishes that navy blue/white is just for winter. No, the hair is not too severe, sleek and well kept. No, sleeveless dresses aren't forbidden in the 21st century in the western world, even for a princess. I find her lovely, and very refreshing. She does look great. Pseudo, thanks for saying what I was thinking. I have a feeling it is only too dark if Meghan is wearing it. I completely agree with Pseudo and Cherry Blossom. Well done, Mary. Lovely outfit for an indoor event. Beautiful dress!! Love Princess Mary!! I am not sure whether Mary is really that tanned as on these photo's, maybe it is just the light but i do not like this kind of tan, it looks cheap. But i think it is just the light because a few days ago she was not as tanned as here. That yellow arrow on Ms. Iversens dress made me think of the Wonderbra-commercial: "Look in my eyes. I said in my eyes!" Princess Mary looks very nice as usual, but the surprise here is Mrs. Iversen and her perfectly fitted dress with a charming and interesting print, her becoming hair style and make-up and her glasses with red frame. Well done. Elegant and beautiful as always. Love the stylish dress. Crown Princess Mary is very much the future queen of Denmark.